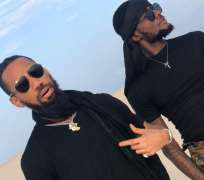 Nigerian singer and producer, Chibuzor Azubuike, popularly known as Phyno has released the much-anticipated video of the song `Nyem Ego’ alongside Lagos based rapper, Tope Onimowo aka Phenom. The Fada-fada’ and Connect’ crooner on Friday took to his instagram handle @phynofino to inform his fans and followers, “Nyem ego VIDEO is out now fam!!! Phenom X [email protected]’’. The video was directed by award-winning music video director and a graduate of Computer Science from the University of Lagos, Olalekan Buhari known as Unlimited LA.